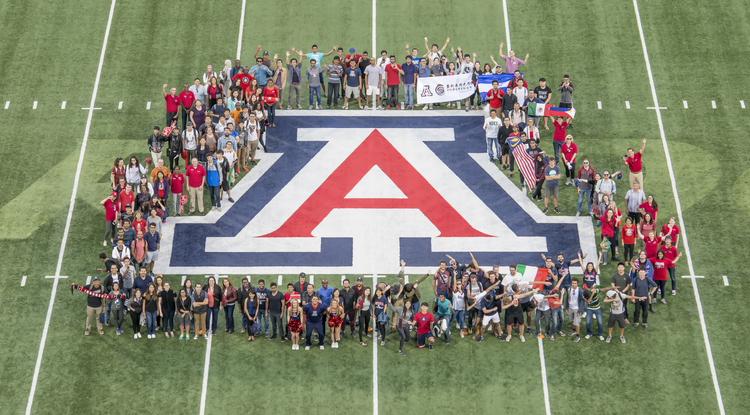 International Education Week unites colleges, departments and units across the University of Arizona campus to celebrate global partnerships, programs and initiatives, as well as international students, faculty and scholars. Despite steep declines in international student enrollment at some U.S. colleges and universities, the UA is showing an increase in the number of those students. The UA hosts more than 1,600 international faculty members and scholars. The most recent numbers from International Student Services show that more than 3,900 international students from 110 countries are currently enrolled in UA undergraduate, graduate and professional degree-seeking programs — an increase of nearly 3 percent over fall 2016. "Celebrating International Education Week at the UA is extremely important because it allows us to pause and reflect on what we do globally, and also celebrate the students, faculty and scholars coming to us from the far corners of the globe — each of whom contributes greatly to the cultural, linguistic and intellectual diversity of our community, " said Suzanne Panferov, interim vice president of the Office of Global Initiatives. An effort of the U.S. Department of State and the U.S. Department of Education, IEW is a nationwide program spearheaded at the UA by the Office of Global Initiatives, although it is open to the entire campus community. During the week, Wildcats celebrate global connections through an array of events, including a pep rally at Arizona Stadium and a talent show at Main Gate Square's Geronimo Plaza. The UA promotes diversity on campus in a number of ways, including global mobility, meaning that international students, faculty and scholars are received on campus while domestic students have the opportunity to study abroad. "International student numbers are holding steady because we are known as a prime destination among generations of global UA alumni," Panferov said. "This history of quality, and especially our attention to international partners who sponsor scholarships, creates a resilient flow of students. Our new global micro-campus initiatives in China and Cambodia have also increased our international student count, though these students are not here on the main campus." The number of international non-degree-seeking students has increased from approximately 100 in 2016 to about 500 today, largely the result of the micro-campus model, which provides international students access to a UA education in their home countries. Retention rates also are strong among the international student population. The 2017-2018 one-year retention rate for international students is nearly 89 percent — the highest ever recorded at the UA. "International students have a lot invested to come here for an education," said Lara Pfaff, program coordinator for international student development with International Student Services. "I also hope our unique programs have something to do with strong retention rates. We strive to support retention by conducting workshops, hosting social gatherings and personally connecting with international students. Events such as International Education Week contribute to a welcoming campus environment, which is important to student success." Also supporting global education, UA Study Abroad sends about 1,300 students on international trips each year through programs in 60 countries. This gives domestic students the opportunity to strengthen their intercultural competence while earning credits toward their degrees. "At any given time, we have hundreds of UA students and scholars touring the world, learning new languages, new points of view and new ways of being," Panferov said. "We celebrate this global richness with hundreds of other universities across the United States during International Education Week." For more information visit https://global.arizona.edu/iew.